Oral mucositis (OM) is one of the most common and debilitating side effects of cancer treatments (Ref. 1). It affects nearly all head and neck cancer patients undergoing radiotherapy, up to 75% of patients undergoing chemotherapy, and up to 100% of patients undergoing bone marrow transplantation (Ref. 1-5). Patients with oral mucositis are 6 times more likely to require reduced dosages of chemotherapy. OM also imparts a 4-fold increased risk of unplanned breaks in radiation therapy and a 3.4-fold risk of breaks or delays in chemotherapy (Ref. 6). In advanced stages, OM can be extremely painful, preventing the patient from eating and requiring hospitalization for re-hydration, opioid pain medication, and total parenteral nutrition (Ref. 1). Up to one-fifth of patients with OM require total parenteral nutrition, with one study finding that a third of patients with grade 3-4 OM required a gastrostomy tube (Ref. 6). It can additionally have a significant negative impact on the patient’s experience of cancer therapy and quality of life (Ref. 7). 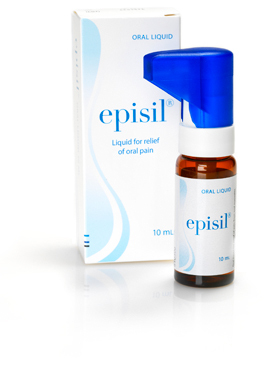 Clinical data demonstrate that episil® liquid, an innovative treatment for the intraoral pain associated with oral mucositis, provides rapid, effective, and long-lasting pain relief by creating a bioadhesive, barrier-forming lipid membrane that coats the mouth (Ref. 8). Without producing a numbing effect, the product soothes painful ulcerations. episil® oral liquid does not require pre-mixing, it comes in a multidose pump device, and can be applied just before meals (Ref. 9). episil® liquid helps patients maintain their quality of life while undergoing cancer therapy (Ref. 10). episil® is a registered trademark by Camurus.